" Dear fellas, I can't believe how fast things move on the outside. I saw an automobile once when I was a kid, but now they're everywhere. The world went and got itself in a big damn hurry"
I borrowed this phrase from my favorite movie The Shawshank Redemption . 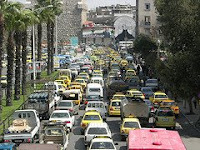 So many people, too many cars, trucks, busses...... Damascus looks like a constant rush hour in New York city. Every Damascene household had at least one car. Smog covered the city with a thick dark cloud. When I left home, everyone's dream back there was to own a car someday. Automobile prices were the highest in the world. " Be careful what you wish for, it might come true". "Driving in Syria is hazardous and requires great caution. Although drivers generally follow traffic signs and signals, they often maneuver aggressively and show little regard for vehicles traveling behind or to the sides of them. Lane markings are usually ignored. Vehicles within Syrian traffic circles must give way to entering traffic, unlike in the United States. At night, it is very hard to see pedestrians, who often walk into traffic with little warning. Outside major cities it is common to find pedestrians, animals and vehicles without lights on the roads at night. Pedestrians must also exercise caution. Parked cars, deteriorating pavement, and guard posts obstruct sidewalks, often forcing pedestrians to walk in the street. Vehicles often do not stop for pedestrians, and regularly run red lights or “jump” the green light well before it changes." This was a direct quote from the U.S. Department of State Website . It summarizes the chaotic state of traffic in Syria. It justifies my fear everytime one of my nieces walks 100 meters to her grandparents house down the street. Is there a quick solution? I'm not sure. I do know it starts with the people, the drivers.